Enter DevilStick Peat, Medieval Jester & Festival Entertainer. A fool par excellence. Peat has been performing at Banquets, festivals and re-enactments for 30 years. During this time he has built up an amazing and unique set of comic magic and juggling routines specially designed to transport your spectators to a time when kings ruled, dragons roared, and the fool, with his wit and skill, had them all eating out of the palm of his hand. Although Peat’s show has been specially designed with medieval events in mind he’s skill is such that it can and has proved to be a crowd drawing attraction at all types of events, including Europe’s biggest medieval events as well as some of England’s largest country fairs. Peat's show can and has worked just as well at small village festivals as it does at Glastonbury festival. When not performing his stage show, Peat can be seen strolling about your event using his various routines to both amaze and amuse members of the public, occasionally stopping to perform quick mini shows that leave the whole family feeling that he performed just for them. DevilStick Peat also has the perfect background for his show, in the form of his medieval encampment. DevilStick Peat provides us with so much more than ‘jester jester’…… I mean just a jester! 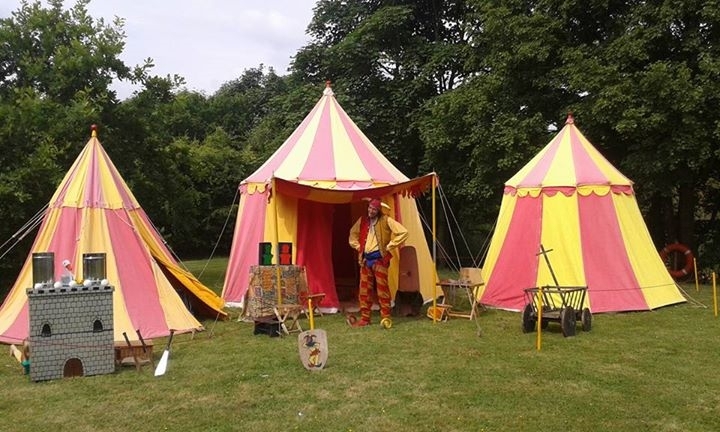 His authentic medieval encampment comprises of up to 4 period tents of various shapes and sizes and all the paraphernalia you’d expect to find in a jester’s camp. This not only makes an excellent back drop for his shows, but also adds to the public’s suspension of disbelief, and is manned (or should that read “womaned”) by his long suffering wife and fellow fool, Jester Dragonfly.